With so many positions to fill, we want recruiters and hiring managers to make the most out of their time spent behind the desk by ensuring quick access to all vacancies related information. 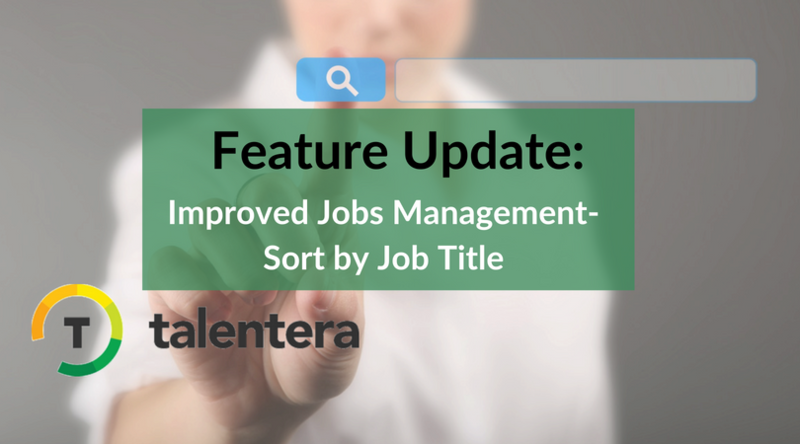 Talentera’s new feature update now allows users to enjoy sorting based on job titles in alphabetical order as our commitment to continue making our hiring technology more user-friendly by the day. Efficiency is the backbone of powerful recruitment- the speed at which you hire can make or break performance targets. This is why the Talentera team works hard with unstoppable determination to connect users to information that is important to them at a click of a button. Speeding up hiring, improving user experience, and making recruitment seamless with quick access to essential jobs’ data adds much needed flair to your talent acquisition strategy (insert high five here). 1) Choose “My Jobs” from the menu bar; select the sorting option in the upper right corner. In the drop down list, you’ll find a new option labeled “Job Title”. Accessing the jobs that are high priority doesn’t get easier than this, take advantage of the phenomenal speed so that you can get more work done in less time.